In less than a month, 400,000 visitors will descend on Grand Rapids, and ArtPrize will provide environmentally-friendly transportation solutions during the sixth annual event. 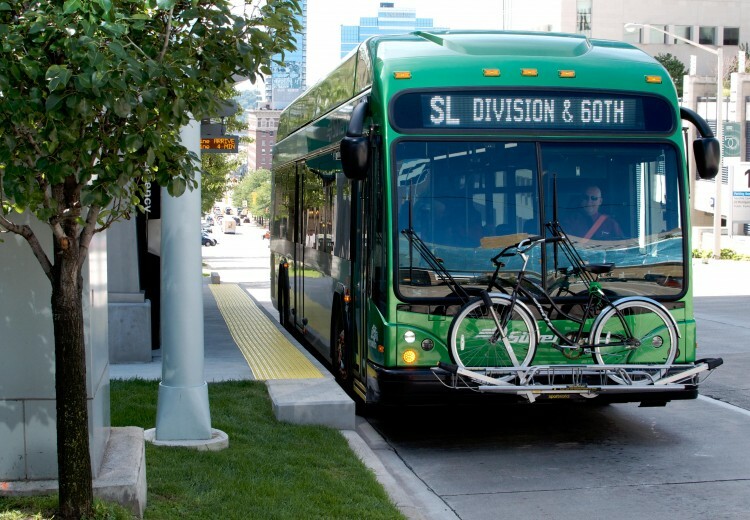 GRAND RAPIDS, Mich. August 28, 2014 – ArtPrize, the radically open international art competition, today announced programming to promote alternative transportation solutions and reduce the carbon footprint of the sixth annual event. In less than a month, over 400,000 people will fill the streets of downtown Grand Rapids, and ArtPrize invites visitors to explore environmentally-friendly ways to get to and around the event, be it by bus, bike, or on foot. ArtPrize will once again introduce Wristbands for unlimited rides on both The Rapid and DASH transit system during the 19-day event this fall. Visitors may purchase two Wristbands for five dollars at any of seven Meijer store locations in the greater Grand Rapids area and receive a free Event Guide—the first stop in learning about the event, the prizes, and where to begin—with their purchase. The participating Meijer store locations will also serve as park-and-rides, allowing visitors to avoid the often frenetic bustle of downtown Grand Rapids during ArtPrize in favor of public transportation. New for 2014, ArtPrize launched Rapid Rides to ArtPrize in partnership with the Grand Rapids Community Foundation and Blue Cross Blue Shield of Michigan. ArtPrize exists to introduce new audiences to contemporary art, igniting conversations around art and engaging all community members equally by reducing socio-economic, cultural, and physical barriers that exist to participation at the ArtPrize event. The Rapid Rides to ArtPrize Wristband grant program will provide 10,000 Wristbands for unlimited free public transportation during ArtPrize 2014 to community members who face income insecurity or language barriers. Each Wristband will come packaged with a 2014 Event Guide. “In collaboration with the Grand Rapids Community Foundation, Blue Cross Blue Shield of Michigan is proud to continue our involvement in ArtPrize by supporting the Rapid Rides to ArtPrize program,” said Jeff Connolly, president of West Michigan at Blue Cross Blue Shield of Michigan. "We're looking forward to helping residents in the greater Grand Rapids area come downtown, take in the extraordinary works of art, and experience what an incredible event ArtPrize is for the whole family." ArtPrize seeks to partner with local community-based organizations to distribute these Wristbands, and invites interested organizations to submit a request for 50, 100, or 250 Wristbands based on need to community@artprize.org by September 5 at 5:00 p.m. EDT. Wristband holders will also be able to ride The Rapid’s recently launched Silver Line. Michigan’s first bus rapid transit service will start at a 200-space park-and-ride on 60th Street and Division Avenue, and loop through downtown Grand Rapids and the ArtPrize district, connecting visitors to three square miles of art and conversation more efficiently and quickly than by car. All Silver Line bus stops are fully accessible, with curbs raised flush with the bus floor for barrier-free entry. Taking advantage of downtown Grand Rapids’ bridges, parks, riverside walkway, and sidewalks, ArtPrize Pathways will help visitors to explore more of the event and our city. Each of four unique Pathways will start and stop at a Silver Line station within the ArtPrize district, taking visitors on a tour passing within a block of 90% of ArtPrize Venues. Each Pathway is a starting point, encouraging visitors to stray from the path, venture outside of their comfort zones, explore beyond what is familiar, and reward their curiosity. Each 2.4 miles or less, the ArtPrize Pathways are fully accessible. Visitors can find Pathway maps in the Event Guide and follow sidewalk stencils calling out each route. For those visitors who will be arriving in downtown Grand Rapids by bike, ArtPrize will have available two free bike valet services—one at the ArtPrize HUB and another at the Ledyard Building. The bike valets will be monitored during the evening and on weekends so visitors may leave their bikes behind, leisurely explore the ArtPrize event, and return with their valet ticket to claim their bike. Also new to ArtPrize and West Michigan is Uber, a rideshare smartphone app that allows users to request a ride within minutes, at the tap of a button. ArtPrize 2014 visitors who download the Uber app may enter the promotional code “ARTPRIZE” between September 24 and October 12 to receive one convenient and cashless trip that is either free or discounted by up to $25. ArtPrize 2014 will run from September 24 to October 12, when 1,536 entries at 174 venues will vie for a combination of public vote and juried awards totaling $560,000. ArtPrize is made possible in part through the generous support of many organizations. Corporate Premier Leadership sponsors include Amway, Founders Brewing Company, Kendall College of Art and Design of Ferris State University, Meijer, PNC Bank and The Rapid. Leadership sponsors include Consumers Energy, CWD Real Estate Investment, Deloitte, Haworth, The Iserv Company, Steelcase Inc., and Wolverine Worldwide. Leading Foundation Supporters include The Richard and Helen DeVos Foundation, The Daniel and Pamella DeVos Foundation, The Douglas and Maria DeVos Foundation, The Frey Foundation, Grand Rapids Community Foundation, and The VanderWeide Family Foundation. MLive Media Group is the Official Provider of the 2014 ArtPrize Event Guide. WOOD TV8 is the Official Broadcast Media Partner of ArtPrize.